Today I found out honey can be used for a variety of medicinal purposes. You may be skeptical about this because many such “natural” alternatives to medicine put forth are not backed by any scientific research. These types of claims are often based primarily on anecdotal evidence, which can be misleading. (I personally was extremely skeptical about honey’s medicinal value, as you can read at the bottom of this article.) However, it turns out there are clear scientific reasons behind why honey works so well as a treatment for a variety of maladies and there have been numerous studies showing just how effective it is compared to certain synthetic pharmaceuticals. From ancient Greece to current underdeveloped countries in Africa, honey has been a sought-after healing agent to treat a wide range of afflictions. Aristotle in 350BC recommended the use of several different types of honey to treat different ailments. Despite being used throughout recorded history, only recently have honey’s medicinal effects been studied in a scientific manner. One of the most important attributes of raw honey in this context is that it possesses inherent antibacterial properties. This makes it particularly useful in treating burns, peptic ulcers, gastroenteritis, and infections. This latter usefulness in treating infections is particularly important given the growing resistance to current antibiotics many microbes are developing. The properties that make honey such a potent antibacterial agent are high viscosity; low pH; high osmolarity with low availability of free water; and its natural ability to produce hydrogen peroxide. It should be noted that certain types of honey have been shown to work better than others. For instance, Manuka honey (honey made from bees pollinating the Manuka tree) has been shown to inhibit the growth of more types of bacteria than many other types of honey. Since it is known that different types of honey have different antibacterial capabilities, honey is now being classified with what is known as its “Inhibine factor,” rating its antimicrobial efficacy. Honey inhibits bacterial growth by stopping it at the cellular level. Staphylococcal forms of bacteria are some of the most common present in wounds. They are also proving to be some of the hardest to kill. Many types of this bacteria have grown resistant to Methicillin, one of the most common classes of antibiotics. When these bacteria clump together, they form a barrier known as a biofilm. Current antibiotics have a very difficult time penetrating these biofilms. Honey, on the other hand, seems to prevent these biofilms from forming. In addition, when already present, it has been shown to still be able to kill up to 85% of the microbes, despite the biofilm. The reason for this seems to be that it prevents the bacteria from clinging to human fibronectin. Fibronectin is a protein on the surface of any damaged cell, such as a burned or ulcerated cell. Honey also generally has a pH value between 3.2- 4.5, making it a very acidic agent. Most bacteria need a less acidic environment to propagate and thrive. For example, E. coli, Salmonella, and Streptococci all need a pH environment of 4 – 4.5 to flourish. Thus, most types of honey will inhibit growth of these common pathogens. 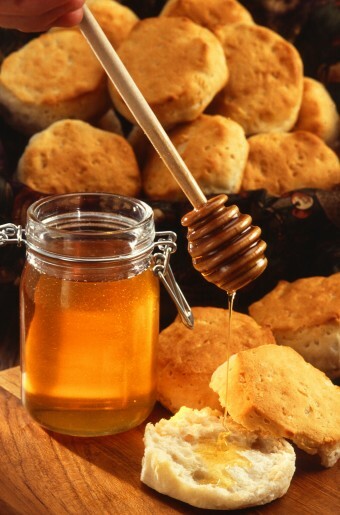 In addition to that, honey has a low availability of water for bacteria to use, being about 84% fructose and glucose. The 15-21% of water by weight in honey strongly interacts with the sugar molecules and, thus, there is very little left available for anything else (like bacteria). This free water, known as the water activity or “aw“, is measured between 5.6-6.2 for most types of honey. For reference, bacteria can have their growth completely inhibited with an aw of 9.4-9.9. Honey also has an enzyme, glucose-oxidase, that produces hydrogen peroxide, particularly during its ripening stages, with the production stopping once the pH drops low enough. That being said, fully ripened honey has a pretty low level of hydrogen peroxide. However, should you dilute the honey in water, this enzyme’s activity increases by a factor of up to 50,000, making it a very effective slow release antiseptic. This “slow release” effect is particularly helpful as it does not damage healthy tissue, which a high dose of hydrogen peroxide will do (even able to destroy newly formed skin cells, which is the opposite of helpful). Rather, these slow release, low doses kill only the germs, while leaving the healthy tissue unharmed. Properly prepared (see Bonus Facts below), this makes a honey/water solution ideal for treating eye infections. In the general case, though, diluting honey and taking advantage of its hydrogen peroxide production will get rid of many of the other antibacterial properties; so usually it’s better to use pure honey, rather than diluted. Specifically, diluting honey will change its pH and it’s aw values. If you choose to dilute the honey, with say, water, then its pH and free-water levels will rise to the point that they won’t inhibit microbial growth and you’ll have to rely more on the increased hydrogen peroxide production to prevent infection. Finally, honey also generally has the effect of reducing pain on burns and open wounds because it prevents air from reaching the wounded area. Further, it has been shown to reduce scarring due to stimulating skin regrowth. Another great side-benefit to using honey to treat burns and cuts is that a bandage used after honey is fully applied to a wounded area won’t stick to the wound when removed. Honey works so well as an antimicrobial agent that it has been beating its synthetic counterparts quite handily in recent scientific studies. For instance, one study comparing the application of honey over common burn treatment agent (silver-sulphadiazine) showed the following: of the burn patients treated with topical honey, 90% of them were microbe-free on the burn after 7 days. Of the patients treated with silver-sulphadiazine, 84% of them not only had positive signs of bacteria, but they also all showed persistent signs of infection. The study concluded that honey made wounds sterile in less time, reduced the chance of scars and post-burn contractures, and drastically enhanced healing overall, compared to the silver-sulpha. One place honey is beginning to be used in the professional medical field is in the cancer ward of Bonn University Children’s Clinic in Germany. What they use there is something called medihoney, which is basically just raw honey that is subjected to regular quality control tests. Cancer patients are particularly vulnerable to infection and other complications due to many of the treatments for cancer inhibiting the body’s natural wound healing ability. As Dr. Simon, who works there, stated, “Normally a skin injury heals in a week, with our children it often takes a month or more.” What they’ve found is that the use of honey causes “dead tissue [to be] rejected faster, and the wounds heal more rapidly… What is more, changing dressings is less painful, since the poultices are easier to remove without damaging the newly formed layers of skin. Even wounds which consistently refused to heal for years can, in our experience, be brought under control with medihoney – and this frequently happens within a few weeks.” Honey also reduces the foul odor that some wounds can produce. *Note: Store-bought honey is typically highly processed and as a result loses much of its effectiveness for medicinal purposes. As such, when using honey as a medicinal agent, you should always use raw, unprocessed honey, which can usually be found at farmers markets, fruit stands, and the like. *Legal Disclaimer: While I am a paramedic, I am not a doctor and more importantly I am not your doctor. This article contains general information about medical conditions and treatments. The information is not advice, and should not be treated as such. You should never delay seeking medical advice, disregard medical advice, or discontinue medical treatment because of information in this article…. There, I’ve covered myself. Honey works extremely well as a cough suppressant. In one study, children with respiratory tract infections were given two teaspoons of raw honey directly before going to bed. Another group were given recommended doses of dextromethorphan, which is a common cough suppressant. The children who were given the honey showed marked signs of decreased coughing in the night, which matched almost perfectly the decreased coughing in the children who were given dextromethorphan. So if you don’t have any cough medicine around, honey seems to be a good natural alternative to synthesized medicine in this case. In 2007, a group of researches studied the effect of creating an eye drop solution made with 20% honey and 80% normal artificial tears. They then tested this against 100% artificial tears on 36 patients, 19 given the honey solution, the rest given the artificial tears. Each person was instructed to use the eye drops three times a day. The results indicated that those who used the honey had improved state of their cornea and significant overall improvement of their eye health. They also reported less discomfort over those who used only artificial tears. In order to make a honey solution suitable for treating eye infections, do the following: take raw honey and distilled or boiled water and mix them together in equal parts. Use an eye dropper to put two or three drops of this solution in your eye three to four times a day (obviously if using boiled water, best to wait for it to cool down a bit before applying to your eye.) 🙂 Such a solution has even been shown to be effective at curing pink-eye in cattle. In his particular study, a herd of cattle had pink-eye and one half were given the above solution regularly, while the other was given the veterinarian prescribed medication. The group given the honey solution were pink-eye free in about half the time the group that used the prescribed medication were. Honey has also been traditionally used to treat sore throats, even commonly used by opera singers and voice actors, generally mixed with lemon and water to create a tonic. Like so many other traditional honey remedies, this one has only been scientifically researched recently to see if the anecdotal evidence matched with reality. In one study, done at the University of Waikato in 2000, they confirmed that honey does indeed make a decent sore throat remedy, even as a treatment for strep throat, caused by Streptococci bacteria. Indeed, they showed in the absence of saliva altogether, honey was drastically more effective than Dequadin and Strepsils at killing the bacteria that cause strep throat. With saliva present, it was just as effective as Dequadin and two and a half times more effective than Strepsils. Garlic also works well on sore throats, though not necessarily on strep throat (hasn’t been proven yet on strep throat, as far as I can tell). According to a study done by the Palo Alto Medical Foundation, eating garlic while you have a sore throat will significantly shorten the duration of your sore throat. Further, it was found that eating garlic on a daily basis will significantly reduce your likely hood of contracting a cold and will reduce the number of days you’re sick, if you do get the cold. As mentioned, honey’s antibiotic capabilities are based partially on which type of plant the nectar was harvested from. On the flip-side, there are plants that bees can make honey from that will make you sick, sometimes fatally. For instance, honey made from rhododendrons can cause dizziness, weakness, excessive perspiration, nausea and vomiting shortly after you ingest it. In rare cases, a person can show symptoms including low blood pressure; low heart rates; and lethal heart rhythms, mimicking Wolff-Parkinson-White syndrome. It can also create first, second, and third degree heart blocks. The cause of the illness is the grayanotoxin present in the rhododendron. Honey’s potential to help with a worldwide decrease in medical expenses is huge (which is why very little research has been done on it until recently; no profit in it for the pharmaceutical companies). Currently, chronic wounds account for up to 4% of health care expenses worldwide. A 3% solution of hydrogen peroxide is effective at removing blood stains. Before washing the clothing that is stained, apply the solution. Next, rinse the clothing with cold water and soap. Repeat as necessary until the blood stain is gone. Do not dry the clothing or apply heat before the stain is completely gone or it will “set” it in the cloth. Small amounts of hydrogen peroxide mixed in water is often used by horticulturists when watering plants. This solution helps prevent root rot and stimulates the plant’s root system development. Hydrogen peroxide can be used to remove skunk odor when mixed with baking soda and a very small amount of hand soap. For you DIY electronic enthusiasts out there, hydrogen peroxide mixed with vinegar and table salt works well for etching printed circuit boards, rather than using ferric chloride or the like. A mixture of hydrogen peroxide with baking soda works well for cleaning the grout in tiled floors. Thank you very much for sharing this healing information with us. I am living and working in Africa and I am very interested into nature ability to cure ills. This is a wonderful article which i will pass on to my friends. I hope that one day in heaven i will have the opportunity to thank your dad for sharing his findings but in the meantime i am thanking his son for passing it on. Absolute thanks and with great respect to both you and your father. We are already believers in nature and have limited faith in synthetic medicinal treatments. Our Toby (3 years old) has had eye infections since birth which have not been helped by the antibiotic eyecreams which the doctor has given. The doctor prescribed the eyecream then ‘dumped’ us out of his register as he saw we had changed our address and were no longer under his catchment. The new doctor will take a few weeks to add us to their register and will not even contemplate seeing Toby and his red lumpy eyes until they have shuffled their papers around for a few weeks. Meanwhile Toby is out of eyecream; which didn’t work anyway but the poor medical ethics still make me grind my teeth. Over the last 15 years my children and I lived in Czech and Spain in rural communities where bees were kept and old remedies were still passed from generation to generation, and seemed to work. So it is with a sense of relief this very day that you, the paramedic, and your father, the ‘witch-doctor'(for want of a better word), have given me confidence in applying the wisdom which my instincts were nagging me to apply. Manuka honey, diluted with water as per the instructions… here we go!! Thank you. And we take full responsibility for all reactions to our treatment. The bible in Proverbs 24:13 says, “My son, eat honey for it is good for you.” . Father knows best! Thank you Jesus! Medihoney works very well. I had surgery to remove a cyst and the area around the site wasn’t healing very well. The nurses applied medihoney to the gauze and in a week the wound had great new tissue growth and dressing changes were not painful as the gauze didn’t stick to the new tissue. As a hobbyist beekeeper for the past 25 years, I always enjoy reading articles like this. Very good work! Thanks! I would also like to point out an interesting ‘trend’. Most of us beekeepers hang together and talk frequently, as most hobbyists do. We have found, that almost none of us have ever had Lyme Disease. Members of my family, my friends etc have all had it multiple times over the past decade, but not us beekeepers. There is some non-rigorous data that indicates the some of the proteins in bee venom kill the spyrochite that causes lyme. Honey cured my eye infection in a week when I had been using prescription eye drops over 4 months with no progress. Its my go to now for my eyes. After reading this article, I have a question that as it is mentioned in the article ” the pH value of honey 3.2-4.5… while some bacteria as E.coli, Salmonella, Streptococci need the pH environment at 4-4.5″. So I think the range for bacteria developing stay in the pH range of honey. Thus, why does honey inhibit the developing of these bacteria ? Is there possible any mistake in the data of pH value posted? I appreciate your time for considering my quest. It actually confused me. I have found that raw honey is indeed very effective in burn treatment! I am always in the kitchen and inevitably, I get burned every few months. I find that the sooner I apply honey, the quicker relief and healing time I have. I only have to apply once for minor burns, and by the next day, there is little to no pain and when I shower, the burn site doesn’t hurt in the warm water like it normally would. Scarring is also minimal and light. I always keep honey around! The 15-21% of water by weight in honey strongly interacts with the sugar molecules and, thus, there is very little left available for anything else (like bacteria). This free water, known as the water activity or “aw“, is measured between 5.6-6.2 for most types of honey. For reference, bacteria can have their growth completely inhibited with an aw of 9.4-9.9.